Catching a shark, that is making pictures of a shark as a subject is always exciting. Although it has become easier in recent years to come close to a shark (or rather: to lure a shy shark to come closer to you) it is still considered a 'high-adrenaline' subject. Alex Mustard spends several pages in his wonderful new book on the different ways of making good shark pictures*. There is a difference between baited and unbaited encounters. The first category allows you to get really close to the shark so that its body, or even just its head will almost fill your frame. This will usually give razorsharp details of the head, nose, pores, teeth etc. I still find the Tokina 10-17 an ideal lense because you can zoom in or out depending on the distance of the shark. A 17 mm fish-eye with teleconverter will also give nice results. Unbaited shots are better for taking natural photo's like a sleeping shark, or a school of hammerheads, mostly at a greater distance. In this case a rectilineair wide angle lense is more suitable. Pelagic sharks like the Oceanics often show up out in the blue or near the surface. 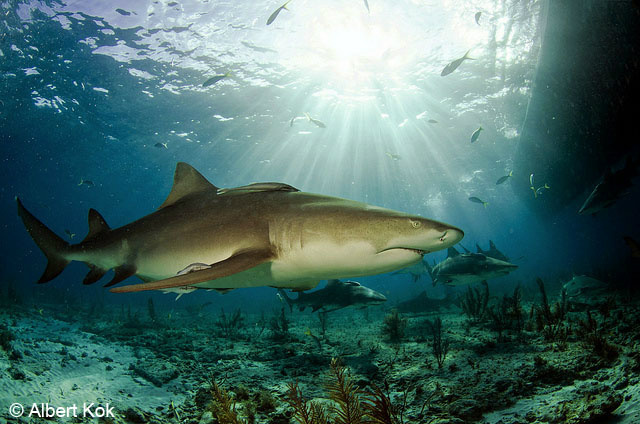 Others, like the Great hammerhead, Tiger or Lemon shark above a more shallow sandy see floor. There is a variety of shots you can consider. One is 'just the shark' surrounded with blue water, with perhaps only a diver on the background or a boat on the surface. With a fish eye lense the diver will look small (and thus more distant) even when he/she only 1 or 2 meter behind the shark. I also like a 'shark portait' with only the softly an evenly lit -but pin sharp- shark against a blue background in the frame. Preferably facing the camera. More dramatic pictures are those in which you have succeeded to add aesthetic elements, like an attractive natural scenery or a colourful soft or stony coral on the foreground. This may require to hide the bait near or behind such an object on the sand or seagrass bed. Sun beams on the background will further increase the dramatic effect. They will be easier to capture in shallow water with a flat and sunlit surface (see insert). Several layers of subjects at different distances will increase the sense of depth and the beauty of your shot. In respective order: a coral head or sea fan, then the shark and finally a bundle of light breaking the surface behind the shark. Natural light is supposed to blend with the light of your strobes to lighten up the foreground subject and/or shark. Some photographers like to use a female model free diving and swimming with a shark. This of course will require the presence of a person that is not only attractive, but also courageous and experienced in handling these kinds of (potentially unsafe) interactions. I must admit that these pictures are not my favorite. Neither the 'selfies' of a diver with a shark on the background. *Underwater Photography Masterclass. Alex Mustard (2016). Ammonite Press.